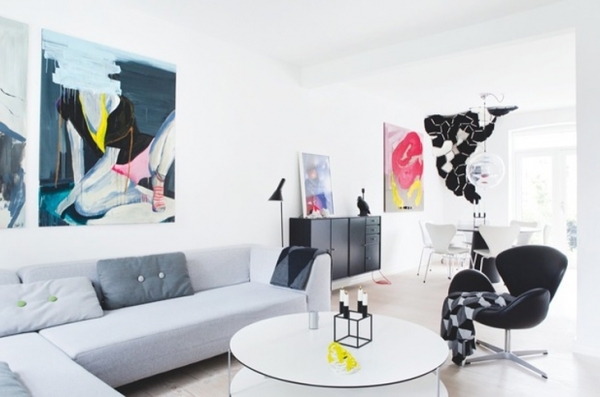 This Scandinavian modern apartment is owned by the architect and artist Anne Boysen Lorenzen. It has fabulous wood beams, contrasting whites and blacks, and light hardwoods, creating a sublime interior design. The living room has a fantastic gray sofa, with light and dark gray pillows. Bright and vivacious artwork is placed on the wall, just above the sofa, adding bursts of color. 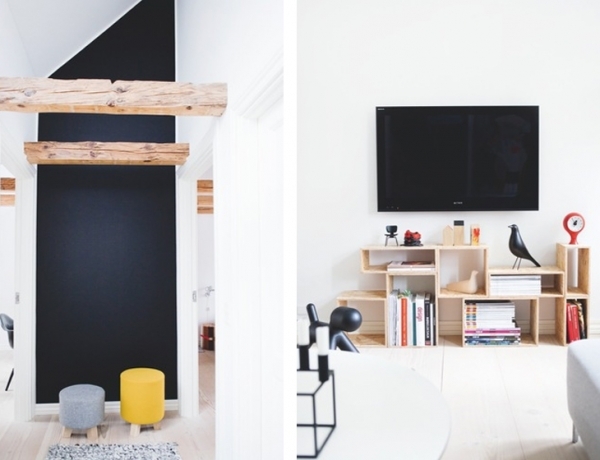 A circular white table and a black Eames chair, complete the seating area, in this gorgeous modern apartment. Still in the living room, but across from the seating area, a large flat screen television and light wooden shelving, with books and decor, provide entertainment and storage in this comfy modern home. The kitchen is clean-lined and sleek, with its completely white cabinets. The whites, blacks, and gray tile, look fantastic in the space, keeping everything modern and stylish. 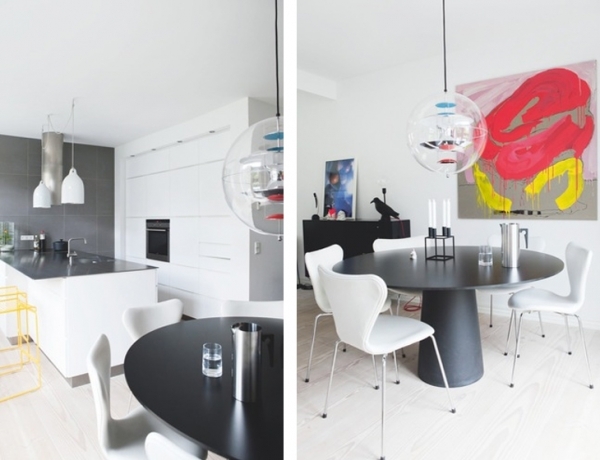 The dining room has a circular black table, surrounded by white Eames chairs. A bright abstract artwork, frames the space, adding a significant amount of interest, and more wonderful color. A clear globe-shaped light, with bright pops of color on the inside, hangs from the ceiling, fashioning an enticing centerpiece for the dining room. The workspace in this modern apartment is simple yet dazzling. 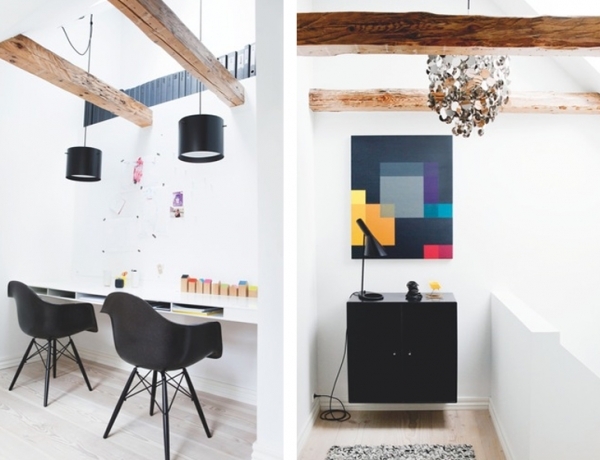 Handsome wood beams line the ceiling, while modern black lighting hangs from it. A white modern built in table, provides ample workspace, and nicely sized storage space. 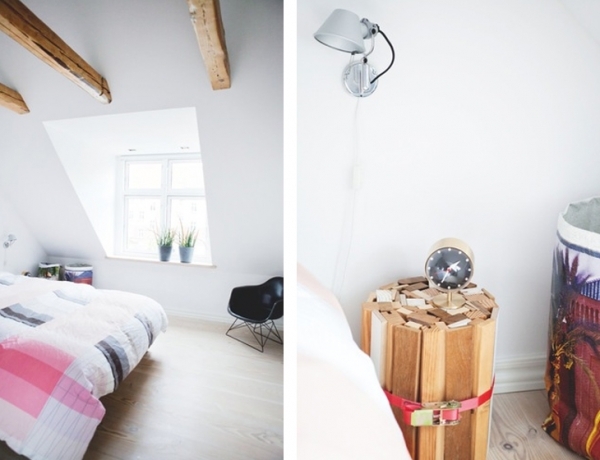 In the bedroom of this modern apartment, the wood beams continue. An uncovered window provides natural light, effectively enlivening the space. The table by the bed is an extremely creative endeavor, it consists of planks of wood, tightly fastened together. A wonderful vintage clock sits on this creative table, adding character and a bit of a homey feel. The whites and blacks create a gorgeous opposition in this home, while the bright bursts of color add style and radiance. The modern aesthetic is used consistently throughout the home, creating a unified and resplendent space.